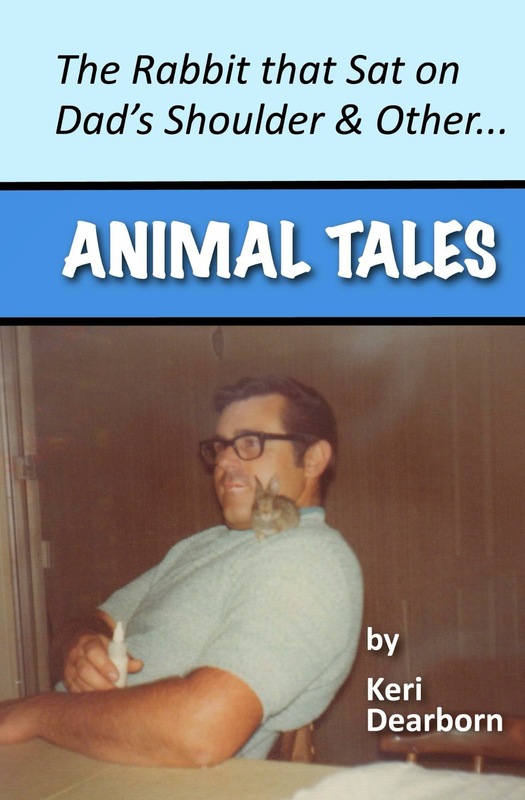 What seems like benign trash to us, can be life-threatening to small animals. A deadly example is the design of the Yoplait plastic yogurt cup. Yogurt is an attractive food to many animals. The shape of the Yoplait container makes it easy for a squirrel or skunk head to go in, but nearly impossible to come back out. Wildlife Emergency Services, a non-profit animal rescue organization, sees many animals trapped in these containers every year. Minimal changes in the yogurt cup's design could make a huge difference and save the lives of wild animals. Check out video of the deadly yogurt cup design. Wildlife Emergency Services has a petition on Change.org in an attempt to encourage a change in the container design. Last weekend, people around the world counted birds in their backyards, local parks, neighborhoods and wildlife areas. India turned out a large number of people submitting this year. In total, 132,656 observation lists have been submitted as of today. The last day to submit lists from the Feb. 14-17 Great Backyard Bird Count is Feb. 28th. It was fascinating to watch the world map on the GBBC website as lists were turned in and their location marked. As I watched, someone in Australia posted their list. There were observers in Iceland, several lists from New Zealand, multiple locations in Africa; people all over the world providing science with a snapshot of bird numbers and activity. Check out the GBBC map. 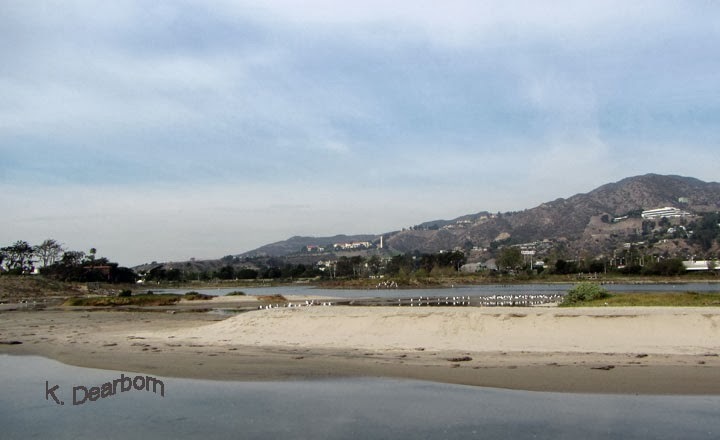 I went out to Malibu Lagoon one morning and to Santa Barbara the next. It was a beautiful weekend for spending time outside. Several of us saw a peregrine falcon at Malibu Lagoon and the best sighting at the estuary wildlife refuge in Santa Barbara was two pairs of greater scaups. My favorite birds this weekend, however, were in my own backyard. 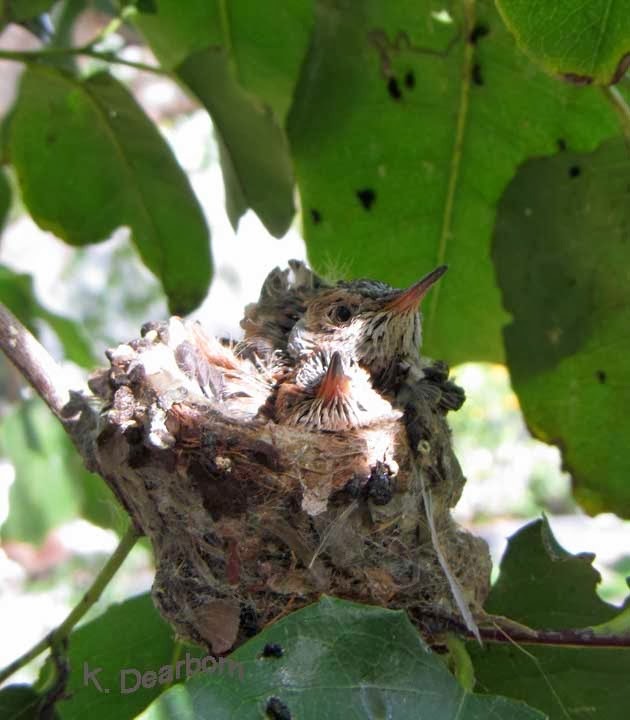 The Allen's hummingbird babies are feathering out. It won't be long before they start trying out their wings. We found their nest in January. And this weekend I spotted a second hummingbird nest. This female Allen's is sitting on two white eggs. 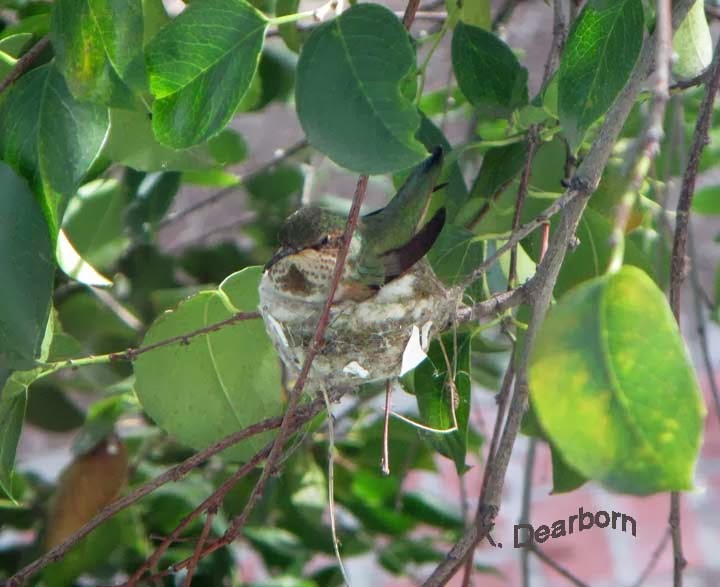 The warm weather in California may bring us a series of nesting hummingbirds this year. Now that you've counted birds for the Great Backyard Bird Count, think about FeederWatch or eBird. FeederWatch: Count birds in your backyard two consecutive days every week or bi-weekly, Nov. - April. eBird: Count birds where and whenever you see them and enter your lists in the largest citizen scientist database in the world. Do something romantic this weekend - Go to your favorite outdoor location and count birds. Across four days each year, people across the country count bird species to take a snapshot of avian populations. You can count for 15 minutes or longer. Watch from a stationary location, like a window, take a walk in your neighborhood, or visit a park. Watch in your yard or even from a terrace. I even try to count the parking-lot birds at my local coffee house at least once over the GBBC weekend. All wild birds are important. If you don't see anything, that is important too. The Great Backyard Bird Count is one of the country's largest citizen scientist opportunities. What you count is important for scientists who study bird populations, migration, the impact of climate change, and specific species information. 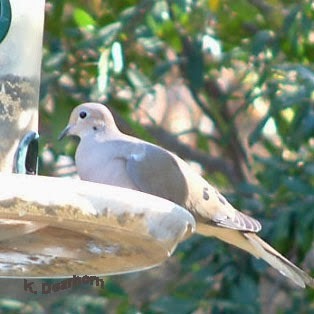 The mourning dove pictured here is typically in the top ten species list for every U.S. state. They are daily visitors to our yard. But last year, mourning doves fell off the lists for some states. Will they be back on the top ten list across the country this year? Or will they continue to decline? The more people that count, the greater the nationwide picture of how birds are doing. Check out the Great Backyard Bird Count website for more information. And GO Count! Sometimes the visitors to your backyard habitat, come and go under the cover of night. We don't know they've dropped in unless they leave a calling card. This morning, we found this print in some damp soil. At first glance it looks like the handprint of a tiny person. But I don't think we currently have any trolls or gnomes. 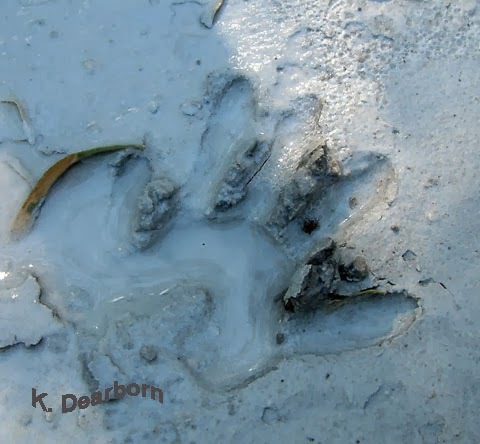 Typically, a "tiny handprint" appearance is the sign of a North American raccoon. We questioned that at first because the raccoon usually has plumper ends to the digits and visible claw marks. However, it must have been how the animal was walking and the dampness of the soil. We have been seeing raccoons off and on since last summer. At about two inches across, this is probably an adult raccoon. 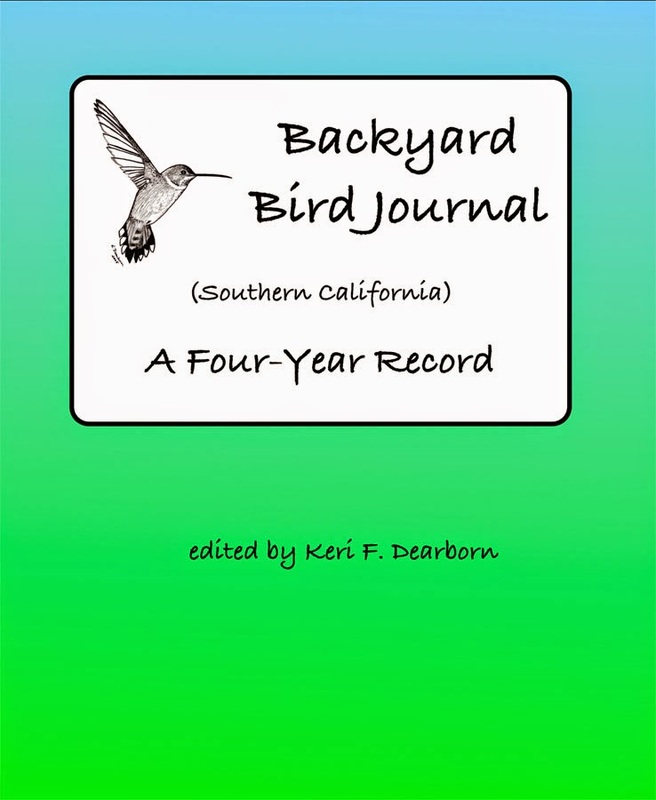 Keri Dearborn is an author, poet, and urban naturalist in the Los Angeles area. She has an MA in Environmental Education and teaches ecology. She's an education consultant and science curriculum developer.